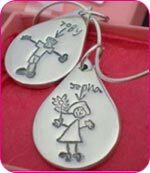 Artwork Jewellery is beautifully hand-crafted Silver Jewellery featuring a child's unique drawing or piece of handwriting. This wonderful process uses traditional jewellery making techniques, combined with a variety of modern technologies to create unique personalised Silver Jewellery that will be cherished forever. Children's line drawings are perfect to recreate into items of cherished Artwork Jewellery. What better way to immortalise your child's first drawing than to capture it forever within a piece of pure fine silver Jewellery? Choose from, Necklaces, Cufflinks, Keyrings, Rings and Pendants. Children's Artwork Jewellery makes a unique, everlasting gift that will be treasured forever.